Internet advertising is one of the most profitable ways to promote your business. Create beautiful visuals for your ads in minutes and start selling more. Why start from scratch, when you can save time editing the templates that are already proven to convert? Our designers created a collection of templates for all industries to inspire you. Online advertising is a great way to deliver promotional marketing messages to potential clients. In the age of internet ads, you can learn more about your audience and target your users with the ad that they are most likely to be interested in. This means you have the possibility to filter the people who see your ads based on their online behavior, interests, and passions. As opposed to classic advertising, with online ads you can see how many people actually viewed your ad and how they responded, so you are able to better optimize them in the future. With Social Media ads and display ads, you have the chance to retarget a user who already visited your site but didn't convert right away. Retargeted ads are efficient because they are delivered to people who are already familiar with your brand and have demonstrated interest. Retarget Marketing tags users by including a pixel within your webpage, which sets a cookie in every visitor's browser. This way, you can show display ads to each user that visited your website elsewhere on the internet, to maximize conversion rates. Go wherever your audience is! With Bannersnack, you'll be able to create all types of internet advertising and get more results. Create single banners or banner sets to promote your business faster than ever! Find or retarget your clients on Social Media! Create the most effective Social Media ads today! Don't stay still in a world of motion! Animate your ads in seconds and get more attention. 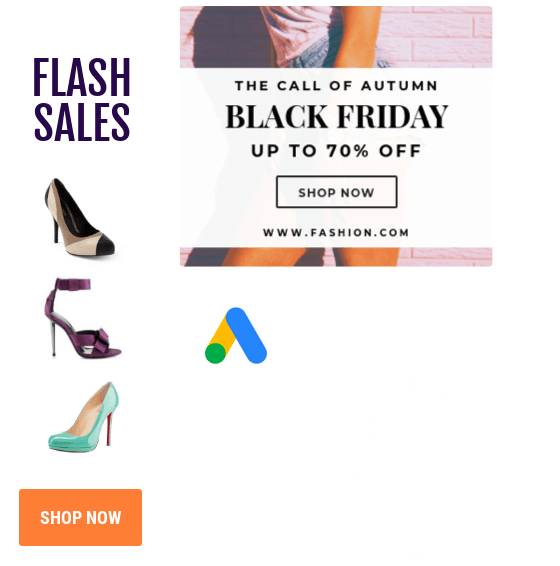 With our internet banner ad creator, you'll be able to create ads faster than ever. It's easy, just follow the step-by-step guide we provide and get started with internet banner ads. Internet banner ads come in all shapes and sizes. Choose from our predefined ad sizes or add a custom size that fits your needs. Don't know where to start? Choose one of our business templates. Feeling inspired? Create your own design! You can edit the images, texts, colors, and shapes to fit your brand and your conversion goal. You have thousands of stock photos, shapes, buttons, and text presets to choose from! Once your design is ready to use, just hit save and download it in the format that fits your needs. Work from anywhere, anytime with our cloud-based software! Keep all your assets in one place and use our editor to create the best visuals for ads and Social Media. You don't have to be a designer to create the best online ads. Our drag-and-drop tool will never cease to amaze you with its features! 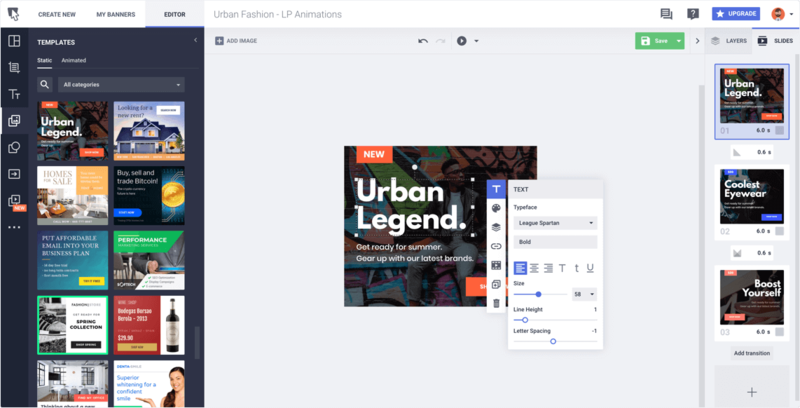 With our easy-to-use, drag-and-drop editor, you will learn how to create visuals in minutes! Just choose the shape or image you need, drag it to your image and customize it your way! Don't waste time searching for the right image for your ad on other websites. With Bannersnack, you have all the stock photos you'll ever need, in one place! We offer unlimited freedom when it comes to fonts! You can choose from our collection of fonts, upload your own, or just use the text presets to get perfect looking ads every time! You name it, we covered it! Choose from our huge collection of templates to get the inspiration you need. Animate your ads in just a few clicks! Now you can test both static and animated versions of the same ad. Create banner sets in seconds with our new banner generator! Edit multiple ads at once with just a few clicks. Online ads don't have to be complicated: you bring your strategy, we deliver the tool! Get ready to create the best types of online ads with a few simple clicks. You are one step away from taking your business to the next level!